Hildreth Meière (1892-1961) is the unsung heroine of the Art Deco movement. 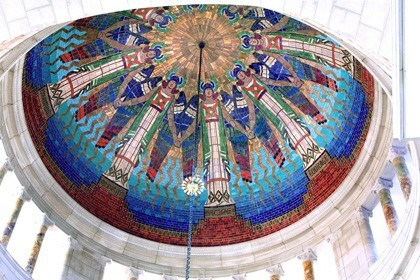 A rare woman in the American architecture world of the 1920s onward, she designed the brilliant roundels at New York’s Radio City Music Hall and the mosaics at St. Bartholomew’s Church and Temple Emanu-El. Catherine Brawer accompanies dazzling color images with an account of Meière’s life, including the start of her career in San Francisco. The author will sign copies of her book, The Art Deco Murals of Hildreth Meière. Wednesday, May 6, 2015, 6:00 p.m.
West on Lake Street, north on 14th Avenue, to building with tall smokestack.